So I am trying to reach my goal of 365 cards for 2013 and I may fall a little short. I am not counting Any Hero cards I send in. I am also trying to use the OWH sketches for my inspiration. This week’s throwdown challenge is to use pink and green (my two favorite color combinations). So my first card is using sketch #57. The cardbase and papers are from GinaK Designs. The tag and circle dies are from Spellbinders. The second card I used sketch #61. The cardbase is MFT sour apple cardstock and I used MFT Flower Medley Die-namics, Razzle Berry ink for the Sentiment (Just Rite — hugs and kisses). Card Creator from Spellbinders are my favorite dies to use. I’m not good with ribbons or lace or fancy embellishments on cards and when making cards for our heroes I try not to add any bulk so that they won’t fall apart with all the handling they go through before they are actually mailed by our heroes to their loved ones. These dies work wonderful for me and I can’t say enough about them. When using the more intricate die cuts I adhere with Aleene’s Crystal Clear Tacky Spray which gives a permanent bond once it is dry. It is a little messy but it gives me peace of mind that everything is going to stay in place. 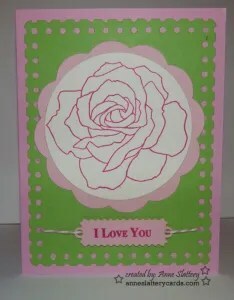 This card I used the Fancy Ribbon Threader (S5-176). This die is very intricate and I spritz the die with some water before running it through the cuttlebug. This helps to cut out all those little details of the die. I used GinaK Designs cardstock for the cardbase. The sentiment is stamped with MFT Razzle Berry ink. For this card I used the Fancy Ribbon Threader – I love this one because all I had to do was weave the ribbon in and out — that ribbon is green with little pink polka dots (how appropriate – don’t know where I got it). And this last one I used the Fancy Postage Edge. The Flower is my all time go to – SU 5th Avenue Floral stamped with MFT Razzle Berry Ink. Well that puts me five cards closer to my goal for 2013. Thanks for stopping by. An array of beautiful cards for our heroes. I also love Fifth Avenue Floral Set Enjoy your night.